Breakout Michigan indie folk group The Accidentals have had a buzzworthy past few years, and for their return to Nashville tonight, April 11 at Exit/In, we couldn’t have hoped for a better co-headliner than local outfit SHEL, whose own genre-defying, technical, classical, layered, and captivating style is similarly hard to define, timeless yet contemporary, complex yet accessible, and finely honed. Joining the two groups is up and coming local singer Stephie James, making for one seriously cool bill from top to bottom! Read on for more about the show, and snag tickets right here! Hailing from Traverse City, Michigan, indie folk group The Accidentals first came together by happenstance, when founding members Savannah Buist and Katie Larson, both still in high school, were paired together for an orchestral event, and soon bonded over a shared taste in music, love of orchestra and folk, and a similar familial musical background (both have professional pianist fathers and vocalist mothers). Adopting a name after the “accidental note” in music, the pair had crafting their self-released, independent debut album within a year, Tangled Red and Blue, which arrived in 2012 and featured a more conventionally contemporary folk bent than subsequent efforts. For 2013 followup, Bittersweet, the pair ran a successful Kickstarter campaign to seek funding, recording across Michigan, Indiana, and Nashville, and significantly raising their profile, amassing critical accolades and a broader fanbase, and soon hitting the road in support of acts like Brandi Carlile, Andrew Bird, The Wailers, Keller Williams, and Joan Baez, also beginning to debut at festivals like SXSW. 2014 saw the official addition of percussionist Michael Dause, and the group, who’s sound had evolved to incorporate elements of folk rock, alt rock, Americana, jazz, classical, country, blues, bluegrass, and everything in between, officially inked a major label record deal ahead of their third full-length, Odyssey, in 2017. More recent years have seen increased presence and prestige, as well as a variety of musical placements, a constant string of tour dates, and an an ever-growing fanbase, and now with a seasoned live show and a finely honed sound, there’s never been a better time to catch the electric trio in action. Hailing originally from Fort Collins, Colorado, though Nashville based now for many years, eclectic folk and alternative pop group SHEL have, in some ways, been a band their whole lives, made up of sisters Sarah, Hannah, Eva, and Liza Holbrook (the moniker taken from an acronym of their first names). Raised by their bohemian, creative family by an artist mother and professional songwriter father, the sisters spent their early years home-schooled and immersed in music, film, and all manors of art, taking up an impressive and diverse array of instruments with classical training, while simultaneously developing a love of classic rock. After several years performing family band style with their father, SHEL spun off into their own, distinct entity, already having attracted plenty of attention and even early record and development deal offers ahead of their impressive, self-titled debut album in 2012. Juxtaposing more traditional, folk-rooted influences with classic rock, awash with soaring four-part harmonies and employing mandolins, violins, percussion, and beatbox in additional to more contemporary rock instrumentation, SHEL drummed up lots of early buzz as well as praise for their independent spirit, both musically and in their overall aesthetic, in which they crafted a unique personal look (complete with homemade top hats) and visual flair (the’ve had a hand in all of their own distinctive music videos). After relocating to Nashville, SHEL completed their sophomore album, 2016’s Just Crazy Enough, working in Music City with producer Brent Maher before tapping Eurythmics’ Dave Stewart to add additional sounds and layers. More adventurous, electronic, genre-bending, and hypnotic, SHEL’s latest was one of our favorite local releases in recent memory, and we can’t wait to hear what they have up their sleeve next. Detroit bred, Nashville based singer Stephie James previously fronted her hometown indie group Blue Mtn Belle, but is now turning to a solo career in Music City, with an EP on the way helmed by buzzy producer Andrija Tokic. While she only seems to have one officially released solo track, “Silent Film,” so far, its retro, soulful, and warm stylings have us instantly hooked, and makes the powerful singer feel like a fitting opener for this bill. Don’t be late! 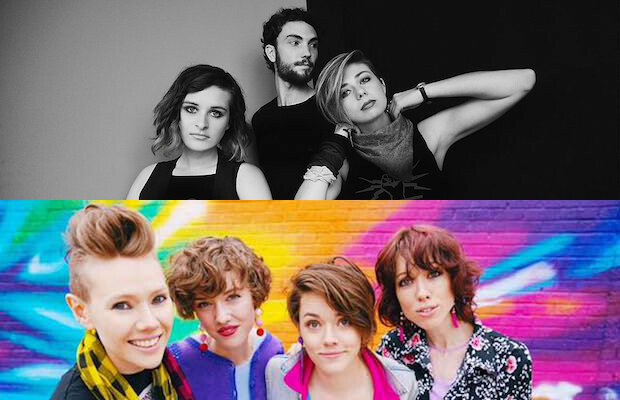 The Accidentals, SHEL, and Stephie James will perform tonight, April 11 at Exit/In. The show is 18+, begins at 8 p.m. (doors at 7 p.m.), and tickets are available to purchase for $18.